The neighborhood will be buzzing with bargain hunters at the Gigantic Old Louisville Yard Sale on Saturday, August 7, beginning at 8am. Toonerville Trolley, Second Street, West St. Catherine, Third Street and 1300 South Third Street are the neighborhood associations signed up to participate as of press time. Shoppers can stroll the following blocks: 1000-1800 South Third Street, 1000-1800 South Second Street, 500-600 West St. Catherine Street, and the blocks bordered by Floyd, Oak, First, and Hill Streets. There is still time for individuals and neighborhood associations to join the sale. Contact the Old Louisville Information Center at 635-5244. Rain date is August 14. Summer is in full swing, and the neighborhood has been bustling with centennial activities. Next up for your enjoyment is the third in our First Sunday Concert Series on August 1. Join us for the fusion jazz sounds of Splatch/Fatt Labb in the park from 3-5 pm. We have extended the deadline for the photography contest to August 31. Entry forms are still available at the Information Center or online by pulling up the June issue of The Old Louisville Journal and printing off a copy. The reception for the award winners will be held in September at the Women’s Club. The specific time and date will be announced in the September issue of the Journal. Please join us for light refreshments and the unveiling of the award winning photographs. Central Park Centennial T-shirts are still available at the Information Center, as well as at all of our summer events. Proceeds from the sale of these $10.00 shirts benefit Central Park. Shirts are available in California Blue, Jade Green, Sunshine Yellow and Ash Gray, and come in sizes M-2XL. Gets yours while they last! Posters commemorating the centennial are also available at the Information Center. The 11x17 version is $2.00 and the 12x36 is $12.00. On the weekend of July 10 and 11, Old Louisville offered a snapshot from the past as folks strolled leisurely in and around Central Park. The 11th Annual Hidden Treasures Garden Tour, in recognition of the Central Park Centennial Celebration, featured a dozen gardens in the neighborhood surrounding the Olmsted-designed park. Visitors also enjoyed the artists at work in the 2nd Annual Art in the Garden event held on the grounds of the DuPont Mansion B&B. Early visitors on Saturday were treated to a Walk and Talk in Central Park, presented by Tom Owen, U of L local historian and Metro Councilperson, and Susan Rademacher, President of the Louisville Olmsted Parks Conservancy. Thanks go to the homeowners who graciously opened their lovely private gardens: Rollia Knight; Lou and Barb Townsend; John Miller/Landward House; Mark Eliason; Anne and Charles Arensburg; Ed and Lori Turley; Gayle and Herb Warren; The Woman’s Club of Louisville; Mark and Claudette Rego; Mike, Candace, and Colin Milligan; Mike and Missy Murphy; and Sam Dorr and Charles Raith. Additional thanks go to the sponsors for their generous support: Alcott & Bentley; Bearwood Gardens/Kevin Kouba; Chef’s Table; Conrad-Caldwell House Museum; Danish Express; Allison and Chris Egan, Remax; Mark E. England, Realtor; DuPont Mansion B&B; Ermin’s Restaurant; Garden Wall; Granville Inn; Gumby’s Garden Room; Kling Center; Mary Martin, Realtor; Masterson’s Restaurant; Michael Mawood, Realtor; Lee Jones/Oak St. Hardware; Old Louisville Coffeehouse; Old Louisville Information Center; Plant Kingdom; Scheler’s Food Mart; 610 Magnolia; Stadium Antique Mall; Deborah Stewart, Realtor; Sweet Home/Renovation Pros; Lois Tash, Realtor; Third Avenue Café; Jeremy Thornewill, M.D. ; Treyton Oak Towers; Councilman George Unseld; Wallitsch’s Nursery; and the Wine Market. We sincerely appreciate their kind support. Also, thanks to all the friends and neighbors who volunteered their time and lent their expertise in various capacities to make this event yet another showcase of Old Louisville’s unique place in both the past and present of the Metro Area. 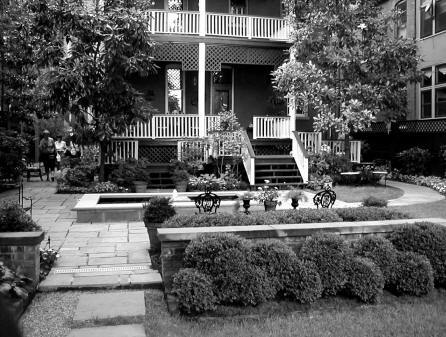 A primary goal of the Garden Tour is to benefit the entire Old Louisville community. It recognizes the talents and efforts of homeowners and the fact that their dedication to fine landscaping contributes to the quality of life for all in the neighborhood. These gardens of high caliber and originality display urban landscapes that help to reduce air and noise pollution and lower summer temperatures. Such landscaping enhances the aesthetics of our fine architecture and inspires the incipient gardeners in our neighborhood to create further green spaces. Proceeds of the Garden Tour will help enhance and preserve our treasured neighborhood. Next year’s Garden Tour route has yet to be decided; If you would like to recommend your own garden or that of a neighbor, please contact Garden Tour Chair, Tim Bottorff (637-5026). Residents of the 1200 block of South Brook Street and the adjacent 100 and 200 blocks of East Ormsby and East Oak Streets are joining forces with the Louisville-Metro Police Department Fifth District to create a five block neighborhood watch area. The neighborhood watch block captains and residents will be working together and with the Fifth District LMPD to quickly share information about crime and other issues that affect their daily quality of life. LMPD Chief Robert White, and Fifth District Major Larry Watkins, Sergeant Doug Sweeney and Officer Tara Long will all take part. George Unseld, Sixth District Metro Councilman, is underwriting the event. Herb and Marjorie Fink may have their hands full with puppies named Tucker and Mechlin. 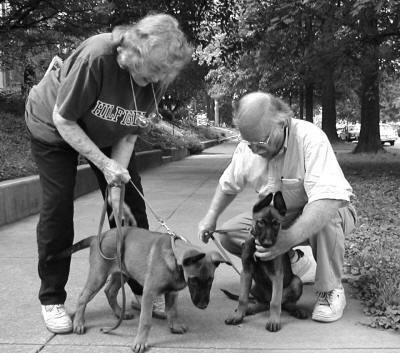 The three-month olds are Belgian Malinoys. Mechlin, in fact, is named after a region in Belgium. Herb says they will grow to the size of German shepherds. Dorothy Heick has grown up with Central Park. 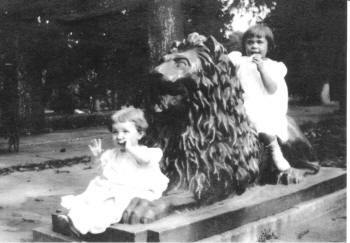 In a photo taken in 1914, only ten years after Central Park opened, Dorothy is shown at the age of 2.5 years sitting one of the two bronze lions with a playmate, Marie Sherry, seated in the front. 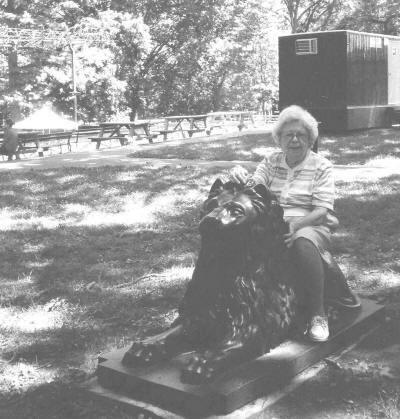 Ninety years later, in June, 2004, Dorothy once again sits on one of the lions for a photo. She will celebrate her 93rd birthday in September. Dorothy, now a resident of Middletown, lived on Hill Street and remembers her father taking her to the park after supper to let her play while he read the newspaper. Dorothy remembers swimming in the indoor pool which remains under the flooring in the basement of the Fifth District headquarters. She enjoyed playing on the Central Park youth volleyball team; when the team won matches with other parks; members were rewarded with additional swimming time in the pool. Taking a sandwich to the park for lunch and participating in park-sponsored youth activities such as folk dancing were also fun for young Dorothy and other children. The current location of the Old Louisville Information Center was once an open-air pavilion. Dorothy remembers visiting it often because she was fascinated with all the stuffed birds displayed in glass cases there. Marlene Lanham of Okolona, a longtime hairdresser of Dorothy, read about the Central Park centennial in the Courier-Journal and brought the photographs to the Old Louisville Information Center. Madonna Wilson, a member of the Central Park Centennial Committee, encourages others who have old photographs taken in Central Park to loan them to the Old Louisville Information Center. They will be used in an exhibit on the history of Central Park which Madonna is assembling for the Information Center in September. The Round Table Theatre Company presents the Louisville premiere of The Last Five Years, a musical by Jason Robert Brown, August 6-August 9, at 7:30 pm at The Rudyard Kipling, 422 W. Oak Street. The two-person musical, starring Broadway veteran Dan Cooney and Louisville native Sara Vise, is a unique and witty look at a couple’s relationship, from beginning to end—and from end to beginning. Old Louisville resident Jon Huffman directs the production. Also an actor and screenwriter, Jon performed out of Los Angeles for many years. He was featured in recurring roles on such TV fare as Designing Women, General Hospital, and Days Of Our Lives and has appeared numerous film roles with such stars as Laurence Fishburne, Armand Assante, Donald Sutherland, and Peter Fonda. He has also been seen on many of Louisville’s stages, including Actor’s Theatre Of Louisville, Derby Dinner Playhouse, and eight seasons with the Kentucky Shakespeare Festival. Dan Cooney is an award-winning actor and producer who has performed on Broadway and Broadway tours in musicals such as Les Miserables, Evita, Fiddler On The Roof, and The Civil War. Off-Broadway, he appeared in the musical, The Thing About Men. Dan is also the co-founder of Music Theatre Of Michigan, and a graduate of Yale School Of Drama. Sara Vise is an up-and-coming homegrown talent who has appeared at Derby Dinner Playhouse and Music Theatre Louisville. Currently, she is a student at Point Park Conservatory, in Pittsburgh, Pennsylvania. Ticket price is $16. For reservations, call 917-679-3078. The Neighborhood Alliance Project is seeking help to complete a community quilt for its second annual Community Read In & Back to School Fair on September 25, 2004. Individuals and organizations can help by sending an 8” x 10” square to be used as part of the quilt. The quilt piece should reflect the art of music, cultural traditions, and family traditions. Donations of the quilt pieces are being accepted through August 12, 2004. The theme this year is “We Shall Overcome.” Quilt pieces depicting things specific to a neighborhood are welcome. For more information, call 502-778-2080 or email LSTEPSISTA@prodigy.net. After years of trying to grow tomatoes with little to show for it come harvest time, John Paul, an Old Louisville resident who resides on Sixth Street, has finally found a way to deal with “those invisible tomato pests,” he said. A four-foot high chicken-wire fence, complete with a couple of padlocks surrounding his six, huge, tomato plants, appears to be the answer. “I’ve got a bumper crop this year, enough for the entire neighborhood,” said John Paul, who has used his creative ingenuity as a handy-person to construct the barricade which borders along side an alley that has a high-volume of late-night pedestrian traffic. “Though at first the initial labor and expense seemed rather elaborate, the results have been well worth the effort,” says John Paul. John Paul is a self-employed graphic artist, who has worked out of his Old Louisville residence for the last 10 years. He is famous for his Mexican-style burritos, which always feature tomatoes and cilantro, which he also grows in his front lawn. “The sunlight is better there,” he said. 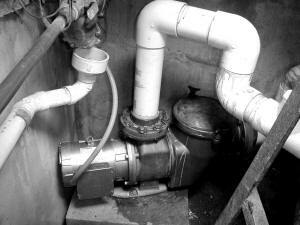 “The secret to a higher yield,” he grinned. 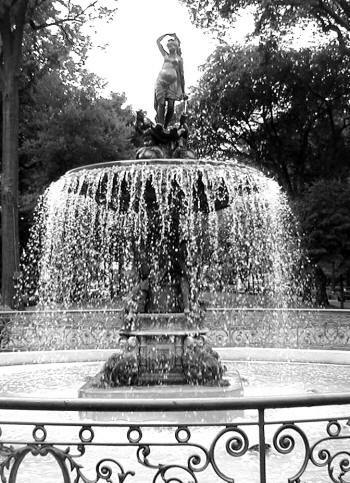 With its graceful female figure at the top, shy cherubs gathered below, and water like a lace tablecloth splashing from its circular pedestal, the Saint James Court fountain is an impressive icon for the neighborhood and city. To St James Court resident Aaron Lucas, however, the fountain is more than just a pretty face; it is an instrument which must be continuously maintained and tuned during its annual March through November season. Aaron, a semi-retired thoracic surgeon, is the keeper of the fountain for the Saint James Court Association. He climbs into the fountain pool at least once a week to clean the strainer which fills up with a surprising amount of natural debris and otherwise. About $100 in coins is retrieved from the fountain pool each year. 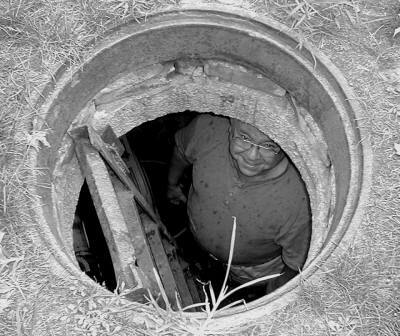 Aaron, who succeeded former Old Louisville resident, Norm Nezelkewicz, as fountain caretaker, oversaw a $10,000 renovation and upgrade of the mechanicals which run the fountain from a manhole nearby. Valves, pumps, electrical boxes, and timers for the fountain’s lighting were repaired or replaced and brought up to code. Glitches still occur. Four pumps were burned out before the right pump for the fountain was installed for the fountain’s narrow water pipes, and last year circuit breakers kicking out required that the fountain be emptied three times just prior to the art show. The current fountain is the second to occupy the space. The original cast-iron version was made by the Mott Foundry of Brooklyn and erected in 1892. Cast iron rusts and the fountain was in greatly deteriorated by the 1960s. Malcolm Bird started a fund from art show proceeds for the $110,000 it would take to dismantle and recast the fountain in bronze. The Fine Arts Sculpture Center in Michigan recast it in 1974 and a dedication ceremony was held in September, 1975. The grille work surrounding the fountain was originally the railing around the box seats at the old Strand Theater in downtown Louisville. Aaron Lucas, a man of many talents, is also a member of the Doctors of Swing, a band which will be performing at the First Sunday Concert in Central Park on September 5, 2004.